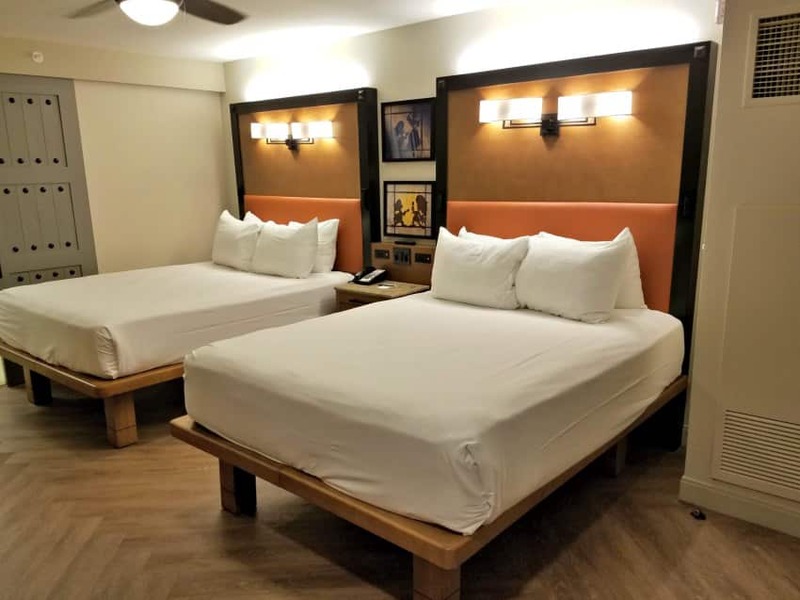 Disney’s Coronado Springs Resort rooms are getting a makeover and I have the inside look! I love this resort and can’t wait to tell you all about it. I know the improvements are only going to make it better! Whenever I have the chance to visit Walt Disney World, I try to stay in a a different resort. My family has stayed in all three levels Disney uses to categorize their properties (value, moderate and deluxe) and there is something to love about all of them. 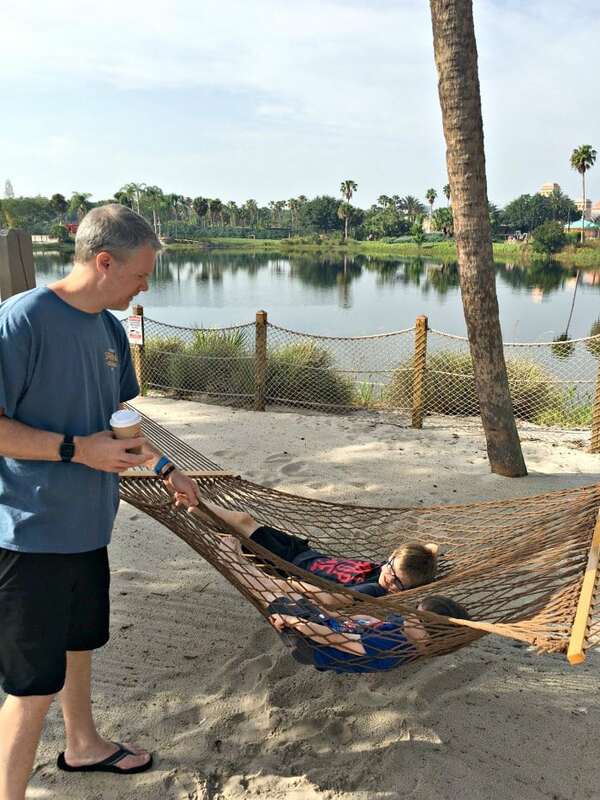 Our latest visit was to Disney Coronado Springs Resort and while I had been there before, it was a first for everyone else. It was a quick trip but we all loved it! With the new Gran Destino Tower nearing completion, this resort is only going to get better. This is a moderate-level resort, with tons of space, yummy restaurants and a convention center so prepare to do a little walking. Our room was in the Cabanas section, which is my favorite because of its proximity to both the main pool and the lobby/dining area. Dining options include Rix Sports Bar and Grill, Pepper Market (which is a family fave!) and Maya Grill among others. There are three distinct areas around the resort lake (Lago Dorado) called Casitas, Ranchos, and Cabanas. They all look different on the outside but the rooms are the same. If you have your own vehicle, it may not matter which room you are in because there is parking near each building. But if you are looking to be in a centralized location, we were really happy with the Cabanas. There is an internal bus system that has 4 stops, the last of which is the Cabanas stop. We loved it because we went straight to the park from our stop without having to circle the resort. Of course this means we were the last stop when it was time for drop-off but it wasn’t an issue since we were already sitting in the a/c. Of course, during the busy seasons, being the last stop could put Cabanas at a disadvantage due to crowds. But we were there over Memorial Day and really didn’t have any issues finding space on the bus. The main stop off the lobby is about a 5 minute walk from the Cabanas though, so you could head that way if you really wanted to be first on. Moderate resorts at Walt Disney World have a reputation for being really spread out. Most of the buildings are 2-3 stories tall as opposed to the towers in deluxe properties. You may have heard that there is currently a tower being built at Coronado Springs so it will soon have the best of both worlds. However, while that will definitely add more rooms, there is still plenty of space to explore. What I love about this resort compared to others like Disney’s Port Orleans Resort – Riverside, is that while there are plenty of trees, they are more on the perimeter instead of every few steps. I love water and wide open spaces so being able to see the landscape stretch out before me is always a huge plus. 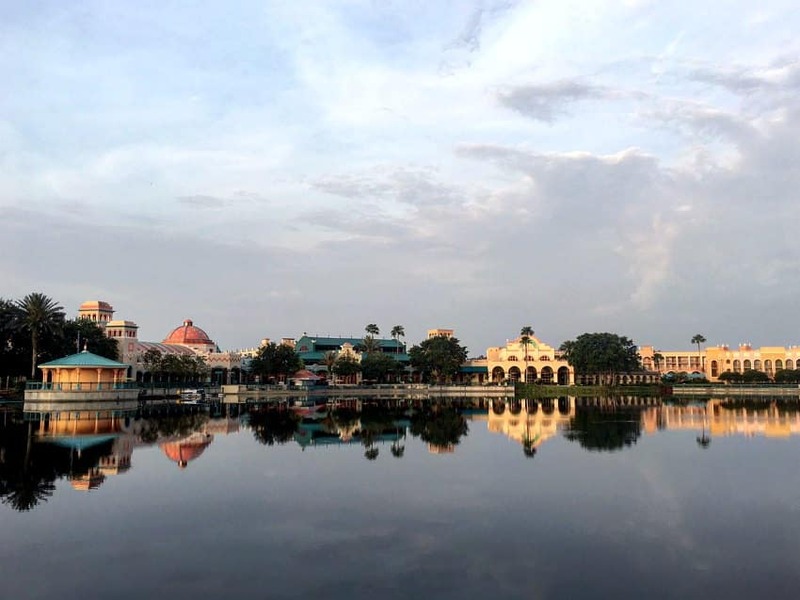 Points for Coronado Springs! During our stay in the Cabanas, we were in the current rooms. The building right next door to us was in the process of being renovated and it was exciting to guess what the new rooms would look like. 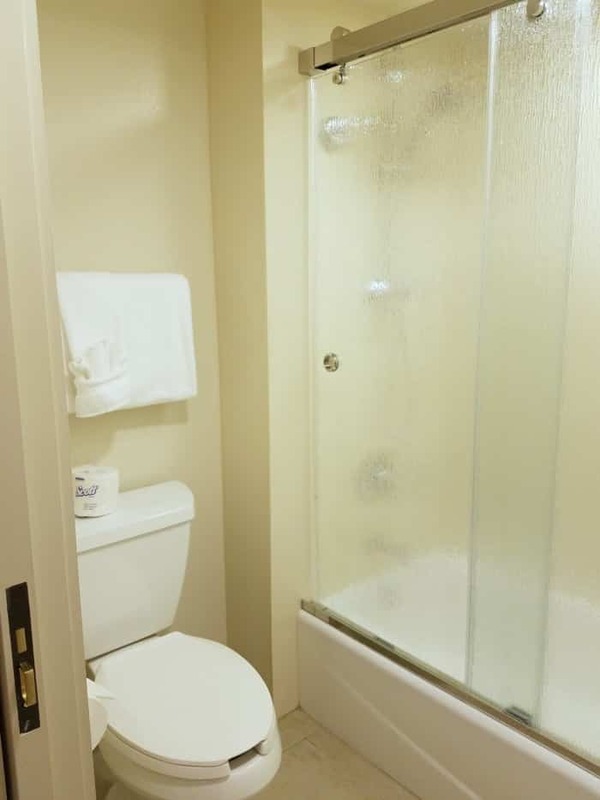 The renovations are currently underway so depending on your timing, you could end up in a new or older style room until they are all finished. 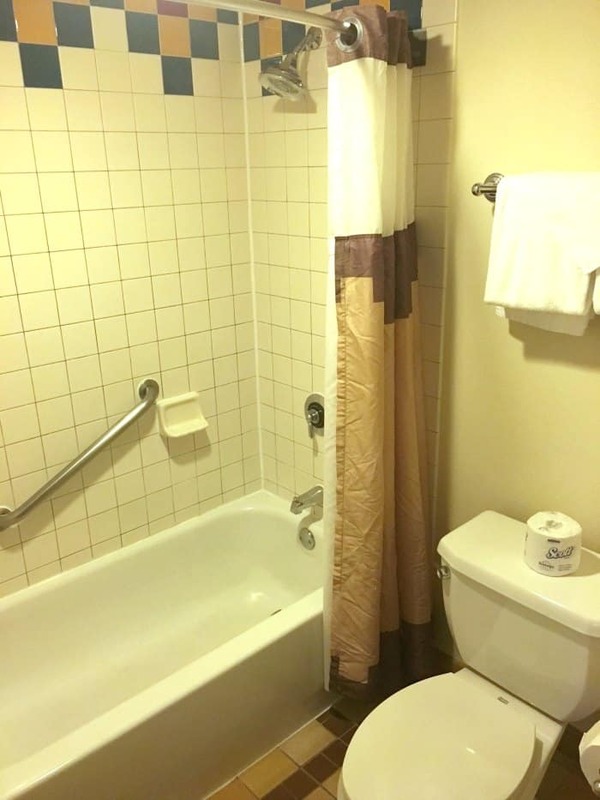 The main thing to notice in my photos is the carpeting and the bathrooms which in my opinion were the most in need of an upgrade. That said, we loved our room and felt it was very clean and well kept. Until we got there anyway! 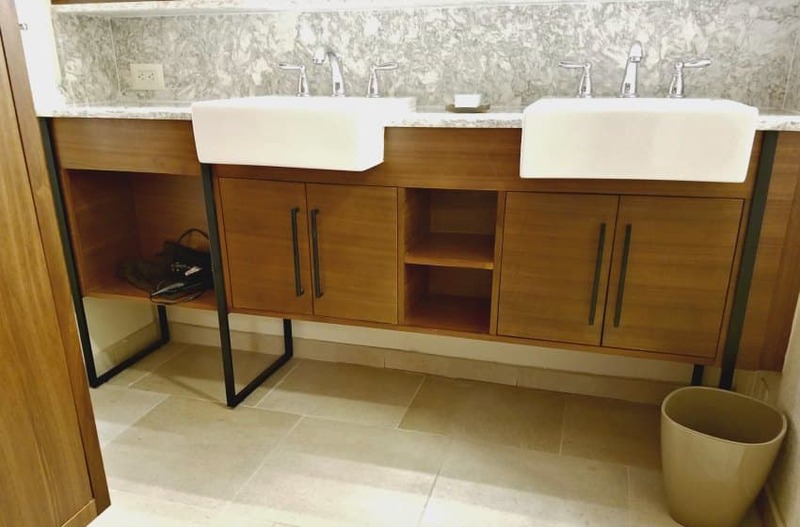 I love the sliding doors to the sink area for added privacy and I’m so happy they kept those in the redesign. I can’t wait to check them out! 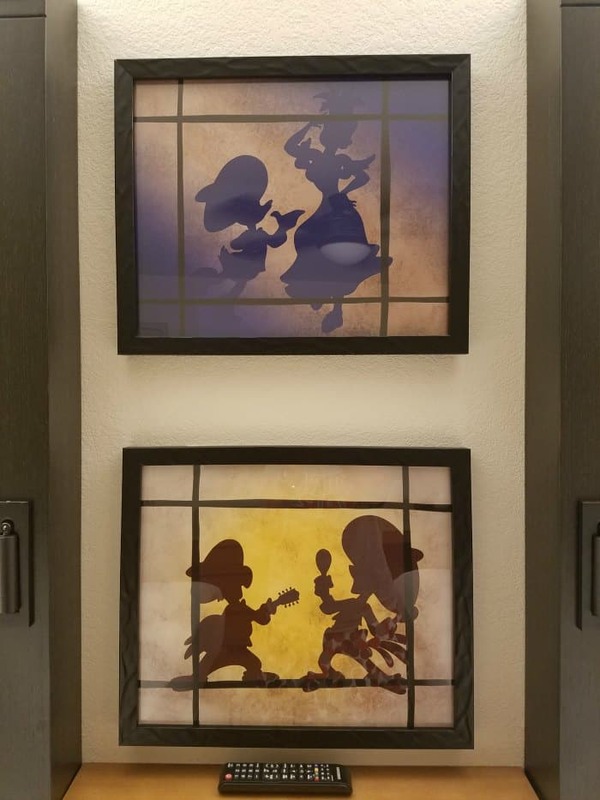 Thankfully, we don’t have to wait because my friend and fellow Disney Parks Moms Panelist, Brandy recently nabbed a new room and took ALL the pics to share with us! Be sure to follow her adventures on Instagram too. You won’t be sorry! Right off the bat, I love the Three Caballeros theme throughout the new design. Disney does so well with subtle yet fun theming and I think they nailed it here. I didn’t mention it above, but this resort has a large convention space so it’s often used for conferences and business travel. I really think the new rooms are buttoned up enough for work but still fun for the kiddos. And since Donald Duck is my personal favorite, you won’t hear any arguments from me on this one! 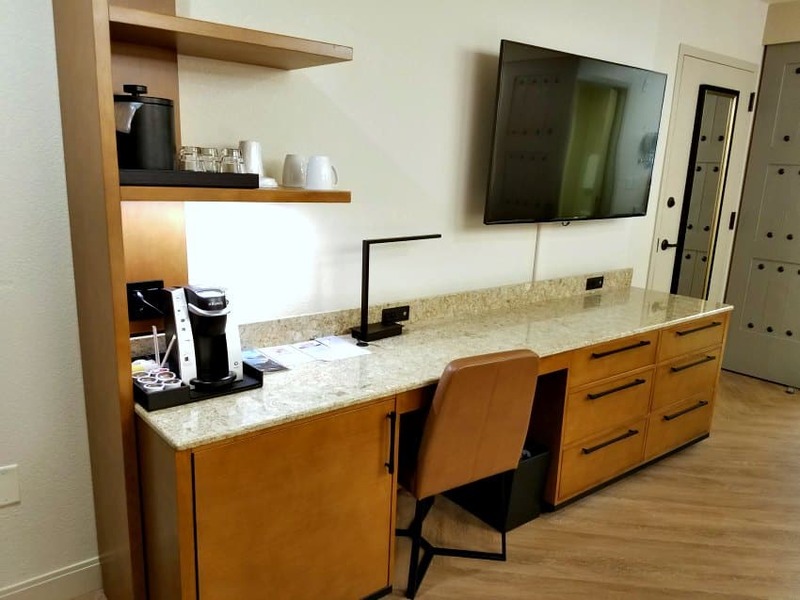 Between the queen-sized beds there are ample outlets for charging devices as well as switches for the overhead lighting and the room phone. You’ll also notice the beds have space under them now, which is great for under bed storage. 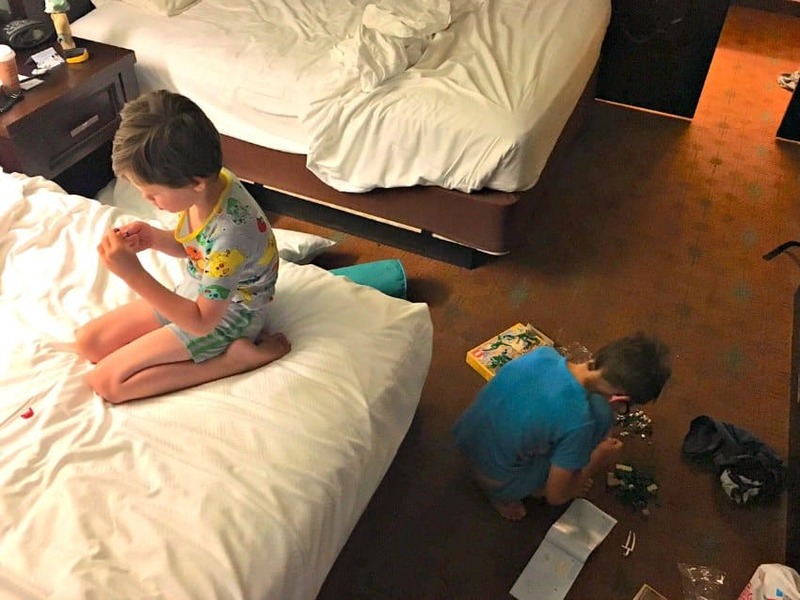 But make sure to up your room-check game when it’s time to check out so you don’t leave any lost toys behind! Oh and speaking of under the beds, no more carpet! I’ve heard some comments that this seems a little cold but I love it. I think these floors will be much easier to keep clean. Plus, they are definitely more allergy-friendly than carpet. On a personal note, I know for an absolute fact that I will run into those bed corners at least 50% of the time so I’m making a mental note to be sure the blankets don’t flop over the edge when we’re walking around. I can already feel the bruises. I love the new workspace/dresser/coffee area. Having everything in one place will make it easy to stay organized. My husband and I usually live out of our luggage but I always put the kids’ items in drawers so this is plenty of space and much more streamlined. 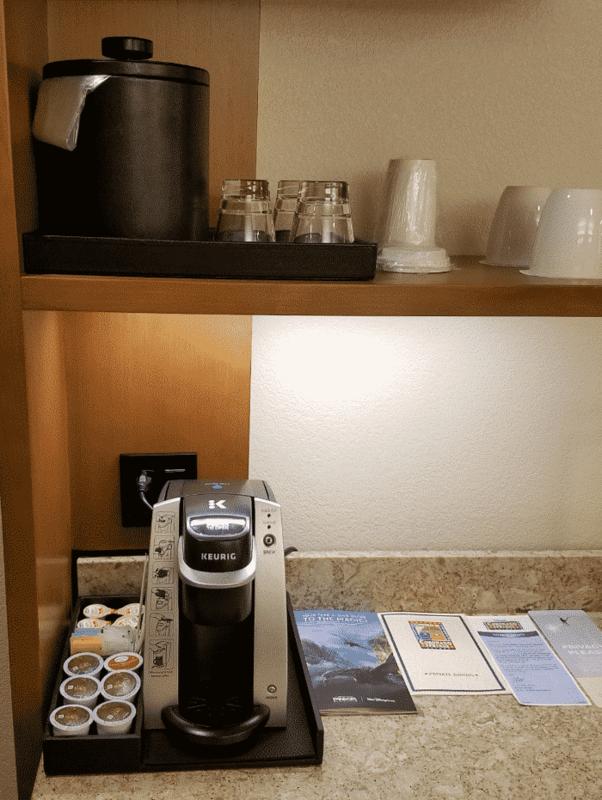 Did I mention the new rooms are using Keurigs now? This is a huge step up from the pods in the old machines if you ask me. The Disney brand, Joffrey’s is complimentary but if you have a favorite kcup, by all means bring it! I’m also really digging the transparent door on the fridge. 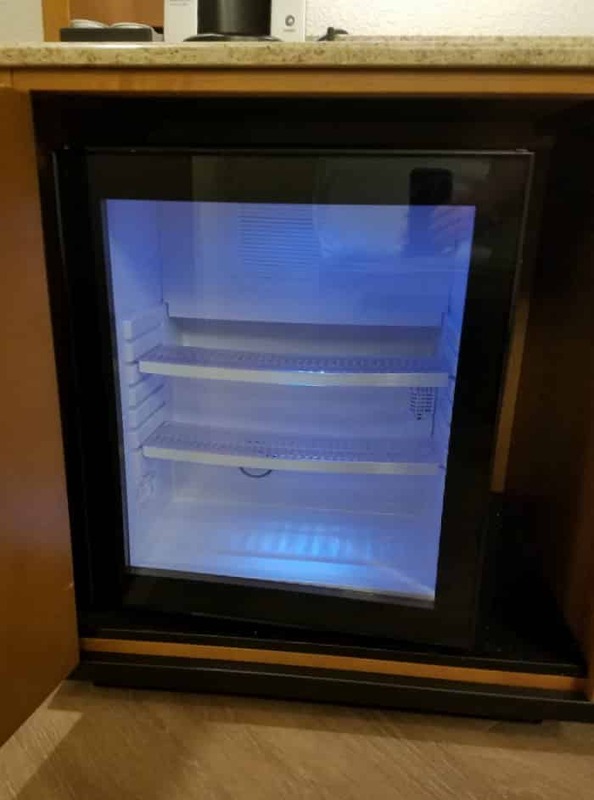 You still have to open the cabinet to see the fridge but if you’re wondering if you remembered to put the water bottle in there before a full day in the parks, you can check and save a little energy. But really, it just looks cool so…. I might be most excited about the new bathroom. This is such an upgrade from the old outdated tile in the old rooms and I love the glass door! A+ here from me. It also seems much brighter which is so important in a bathroom and hard to achieve without windows. The new sink area also looks really nice and full of storage. I’m not quite sure how deep the counter space is from these pics so if you like to spread out (like we do) you may want to rethink that in favor of a bag you can take in and out of the cabinet below. Finally, near the sink area, there is now a standing wardrobe where a closet bar used to be. This is is a nice addition and more compact than before. I also like that you can close the doors when it starts getting ugly. 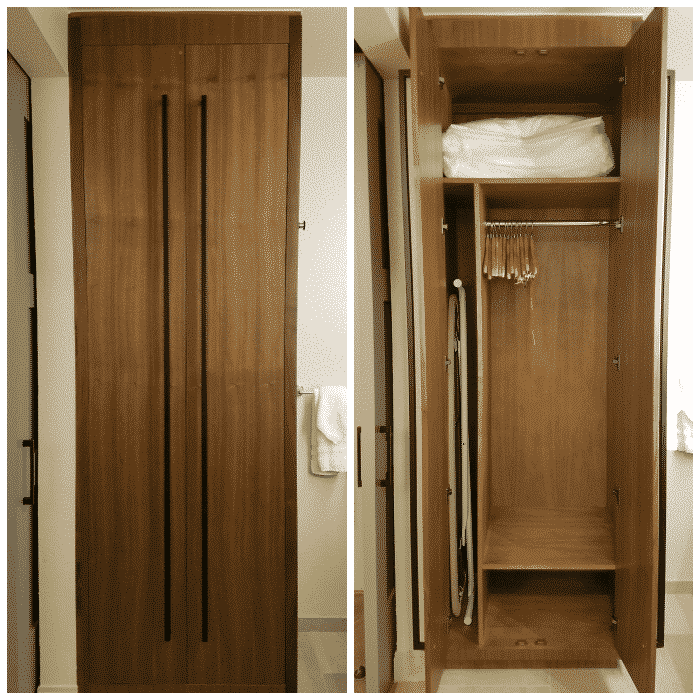 This would be the perfect spot for our traveling laundry hamper. While the resort is scheduled to be under renovation for some time, Disney does a great job of keeping the noise down and typically works during the day (between 9-5) while most people are in the parks. 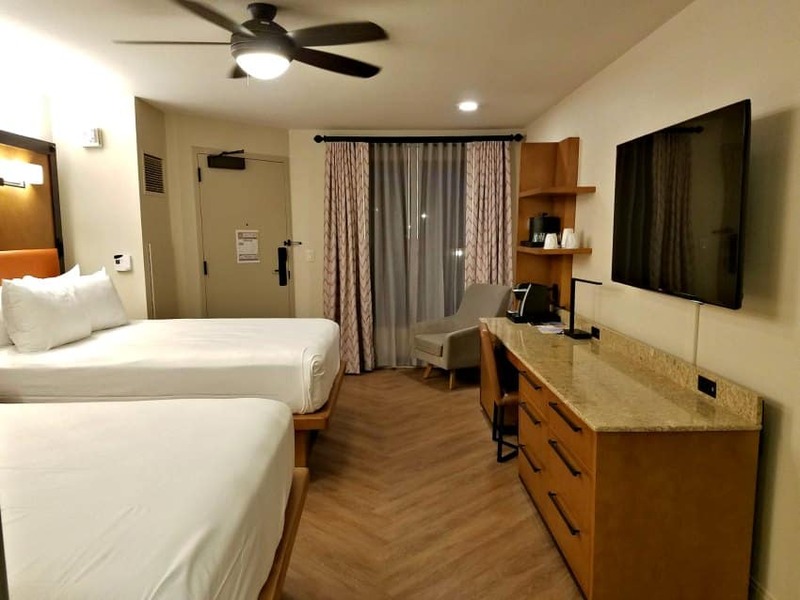 The upside is, you may score a great deal on a room like we did and have a blast! 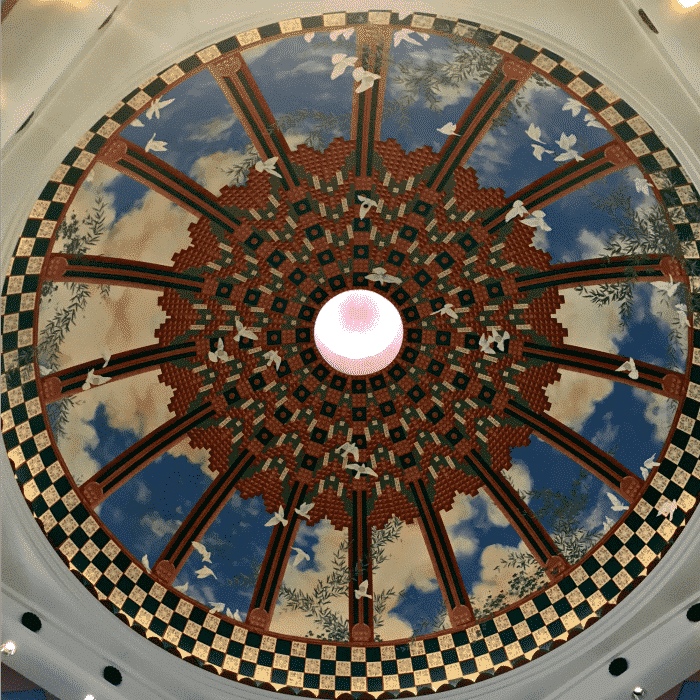 I’m really happy with the way the renovations are coming along at Coronado Springs. I was a late bloomer when it came to loving this resort because I was afraid of the distance from the parks and extra walking. But we really fell in love with it and I know we’ll be back. 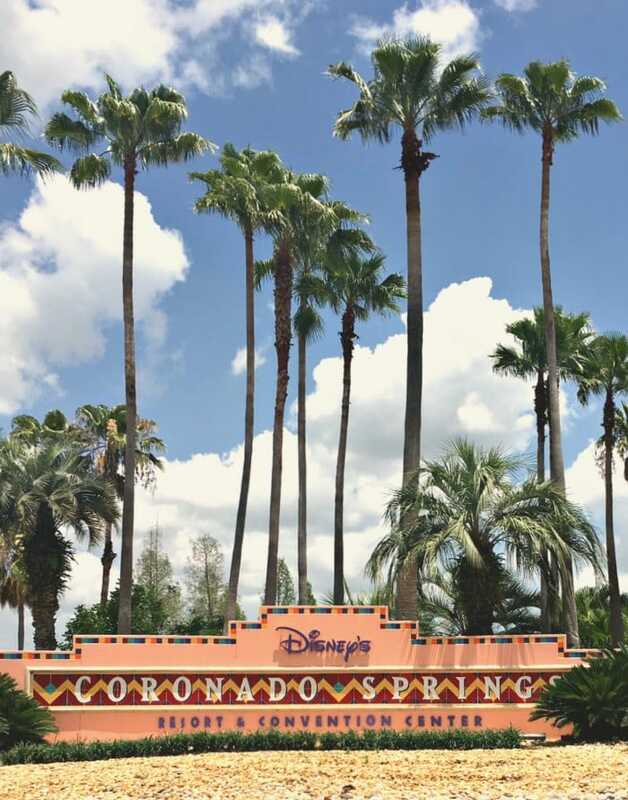 New details are emerging on the brand new tower addition at Coronado Springs Resort and they are really exciting! Not only will the tower add hundreds of rooms and some family suites, it will offer amazing views and a new main entrance to the resort through a 2-story lobby. I don’t know about you, but I love a good lobby! The Disney Parks blog also just released new renderings of what the rooms will look like and I really like them! 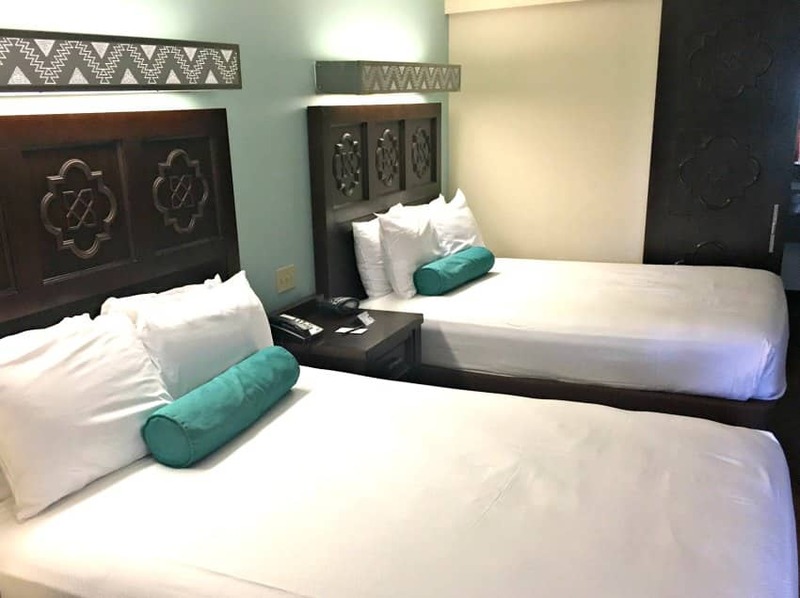 They are very similar to the newer rooms at Coronado Springs, but they seem a little more upscale to me. We can’t wait! Reservations are open and you can start booking this Resort now for dates starting July 2019! Want more Disney? I’ve got you covered. I haven’t stayed there since my convention days over a decade ago (ok more than that, but let’s pretend) but I remember really liking the resort. It felt much more themed than Caribbean Beach, in a good way. I’m curious as to why so many resorts are taking out the carpets in the newer rooms. Allergies? Easier upkeep in the Florida damp? I agree with you that the bathroom looks awesome in the new room. We got a room at Yacht Club a couple years ago with hardwoods and it took some getting used to. But the more I think about it the more I like it. Carpet just has the potential to get gross super fast. Truly an underrated resort IMO. The room re-do looks FAB!!!!! So much brighter, the older decor needed some freshening up and now I do believe this will be my go to Mod resort. Best pool, best quick service and so quiet since it is spread out. Great photos! I’m with you! Definitely my favorite mod at the moment. And I DO love that pool. What are the restaurants like, we booked two preferred rooms as my husband has muscular dystrophy so needed to be nearer the bus stop and restaurants, have been told there will be less of a walk than the other rooms. Hi Alberta, the restaurants are mostly in the main building where you check in. Depending on where your room is, it may be a bit of a walk. That said, if you have a preferred room, you should be a little closer. Also, there are several bus stops around the resort so you do have the option on hopping on the nearest one and getting off at the main building. I recommend going to the front desk when you arrive (even if you have online checkin) to remind them of your situation. In my experience, the Cast Members there at the resort will do what they can to make sure you are comfortable. I hope you love your vacation! Hi! Do you know what areas currently have the newly refurbished rooms? HI! 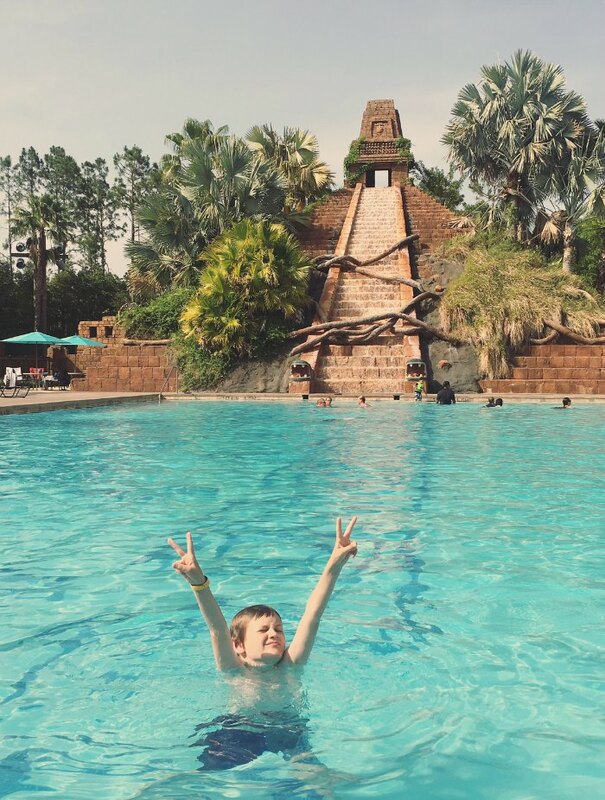 We just booked a vacation for this coming October and will be staying at Coronado Springs. 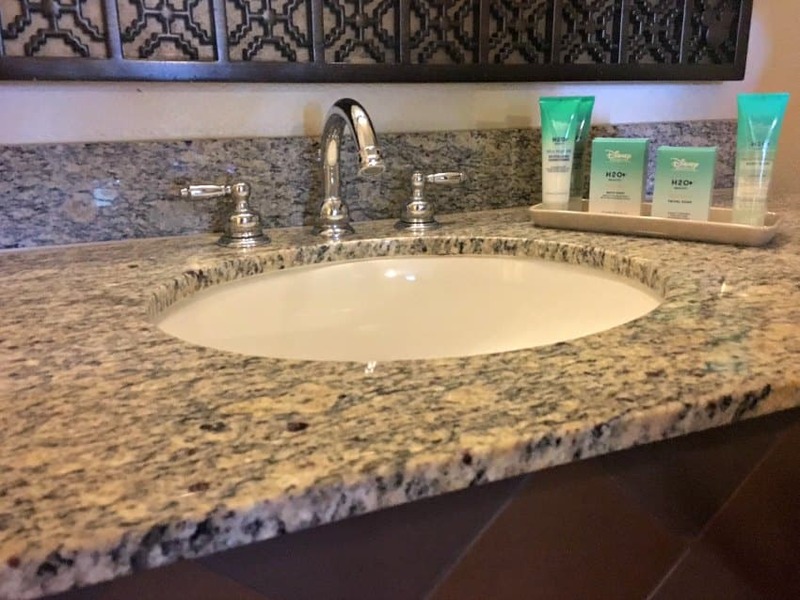 Do you know if the renovations are being completed in all of the rooms or just certain areas of the resort? From what I can tell all Guests are in refurbished rooms now. You may have some construction noise from other work around the resort, but in my experience they do a really great job of minimizing that. I hope you have a wonderful trip! !